Among the multitude of reasons for consuming raw and living foods possibly the single greatest is their enzymatic content. Enzymes are catalysts, tiny electrically charged proteins, that literally provide the spark to turn the “engine” over, for every one of the millions of biochemical reactions that combine to cause the miracle of life. Enzymes come in three broad categories. Two of these categories are endogenous, meaning they happen within us. They are digestive enzymes, that facilitate the digestion and absorption of our food, and metabolic enzymes that drive all other functions of our bodies. These activities range from movement and mental activity to cellular repair and healing. The first two endogenous categories come from the same “enzyme resource” within us. We call this enzyme potential and they are comparable to stem cells: the immature, undifferentiated cells that our bodies take, modify, and use to replenish tissues. Our enzyme resource is a finite resource. Though aided by optimum nutritional intake, it is gradually depleted throughout our lives and consequently the body’s processes becomes less efficient. We are less able to digest and metabolize our food, less able to repair oxidative damage, and less able to perform all physiological functions as we age. In studies conducted by Dr. Meyer and associates at Michael Reese Hospital in Chicago, they found the enzymatic concentration of saliva in young adults was more than 30 times that of those over the age of 69 years. The third category is exogenous, meaning it comes from outside of our bodies, and includes all the enzymes we get from foods. Specifically, raw and living plant foods. The enzymes specific to raw plants are purposely designed to break down its particular array of nutrients. These enzymes are vital in the effective digestion of foods and absorption of their nutrients. This becomes increasingly important as we make mounting enzymatic withdrawals through aging, illness, pollution exposure, and unhealthy lifestyle choices. However, food enzymes are destroyed by cooking and begin deteriorating at exposure to heat above 105ºF (40ºC). That is less than half of boiling point. If insufficient digestive enzymes are available they are diverted from our enzyme resources in glands, neural tissue, organs, and blood. The vitality of these areas suffers. We believe chronic enzyme deficiency is a significant contributor to aging, disease, and death. There are still some who argue that food enzymes are merely benign proteins, subject to the digestive and physiological stresses of all proteins. This is not the case. In his book Enzyme Nutrition, Dr. Edward Howell discusses the electrical charge of enzymes and the living plant foods that contain them. To understand the important role enzymes play in our bodies, researchers tagged supplemental enzymes and traced them through the digestive tract. These tagged enzymes were found in the liver, spleen, kidneys, heart, lungs, and urine. We now understand that the electrical charge of any substance is a link to its ability to transmit energy. The life force of living foods is passed into our cells, elevating their frequencies and ability to produce energy. This energy is devoted to metabolism, cleansing, and healing. Significant enzymatic depletion is a key factor in creating disease. This is an exponential factor when the diet consists of cooked food that has become devoid of enzymes due to heating about 118ºF (47ºC). Food enzymes enhance the metabolism of living foods and catalyze our body’s restoration and prevention of disease. Our body wants to be in balance. Our immune systems are amazing recuperative mechanisms. Given what it needs in the way of nutritional support, our immune system is capable of remarkable feats of rejuvenation. Enzymes drive all healing in our body. Enzymes consist of long strings of amino acids each bonded to the next by chemical bonds. The vast majority of enzymes are made of only 20 different kinds of amino acids. The structure and function of the enzyme is determined by the order of the amino acids. No two enzymes are alike. Each enzyme has its own unique sequence of amino acids, which is determined by the genes in the cells. Most enzymes do not look like a long string of amino acids. In most enzymes, the string is coiled and folded thousands of times to form a highly complex three-dimensional structure. It is the chemical interactions between the amino acids that force the enzymes into their three-dimensional structure, which is held together by the many different links between the different amino acids. The arrangement of amino acids determines the enzyme’s function. The three-dimensional structure of enzymes is determined by the order of the amino acids in the coiled string. Even slight changes in the sequence of the amino acids on the string have a huge impact on the structure of the protein. With just one or perhaps a few amino acids replaced or switched, an enzyme may not only look different, but also act different. With only a slight change in the sequence of the amino acids, an enzyme may be converted into working on other biological molecules or treating them differently. Adding heat to the enzyme can cause a major change in the structure of the enzyme causing it to become biologically inactive as well as a foreign substance to the human immune system setting of an unwanted chain of events. You may have heard of people who are lactose intolerant, or you may suffer from this problem yourself. The intestinal cells of lactose intolerant people do not produce lactase, the enzyme needed to break down the sugar in milk, called lactose. The intolerance arises when the lactose can’t be broken into glucose components and therefore can’t be digested. This problem shows how the lack of just one enzyme in the human body can lead to problems. A person who is lactose intolerant can take supplemental lactase prior to consuming dairy and the problem is solved. But most enzyme deficiencies are not as easy to fix. Inside a bacterium there are about 1,000 types of enzymes (lactase being one of them). All of the enzymes float freely in the cytoplasm waiting for the chemical they recognize to float by. 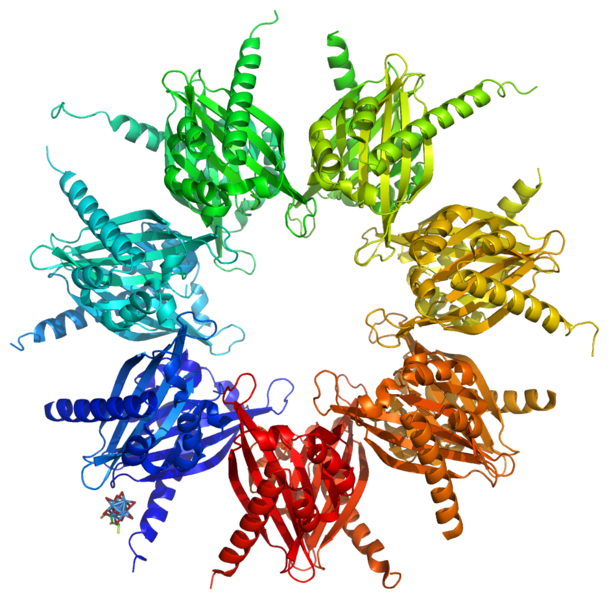 There are hundreds of millions of copies of each type of enzyme, depending on how important a reaction is to a cell and how often the reaction is needed. These enzymes do everything from breaking glucose down for energy to building cell walls, constructing new enzymes and allowing the cell to reproduce. Enzymes do all of the work inside cells. The human body is made up of trillions of cells, and there are different cells for different functions. Cells are little bundles of chemical reactions. They reproduce, create energy, break molecules down (catabolism), and build them up (anabolism). All that action going on is made possible by the enzymes and is part of the process called metabolism. Enzymes exist to speed up all vital biological processes. In the stomach, for instance, they ensure that food is cut into tiny particles that can be converted into energy in the body. The process starts in your mouth while you chew. An enzyme called amylase begins working on all incoming food particles. Like a well-drilled team of engineers, different enzymes continue to break down the food all the way to the stomach and intestines. Breaking down what we eat is an essential part of converting food to energy. Undigested food is unable to pass on the energy stored within it. The enzymes involved in the digestion process carry out the final cutting, or lysing, of food particles so that they can be converted into the essential energy needed by your body. Without enzymes you would die from starvation, even sitting in the middle of a restaurant waving your gold card. One of the unique things about enzymes is that they have one function and one function only. Every function or substrate in an organism has its own unique enzyme. The substrate which is to be transformed fits the enzyme like a key in a lock. Only when the right enzyme finds the right substrate can biochemical reactions occur. When an enzyme does its job, there are no side effects. For instance, when enzymes transform starch into sugar, you can be sure that that is all that will happen. No other material or process will be altered or affected. Enzymes are not living organisms; they are simply biological molecules that do not live or die. They just keep on working until they dissolve. Enzymes are catalysts, which means that they are not part of the final product of the biochemical reaction they catalyze. When the biochemical reaction is over, the product of the reaction leaves the enzyme. The enzyme is then ready to create the same reaction on another molecule again and again. Given the right conditions to function, the enzyme can continue for as long as needed. Enzymes are far more stable catalysts than other chemicals or biological molecules. At the same time, enzymes also work at low temperature and moderate pH. This is not the case for most chemicals which perform the same processes. For this reason, enzymes are an environmentally friendly solution to industrial problems. Naturally-occurring microorganisms are the most productive producers of enzymes. They are easy to handle, can be grown in huge tanks without light, and have a very high growth rate. Some examples of these enzyme-producing microorganisms are the bacterium Bacillus subtilis and the fungus Aspergillus oryzae. Both have a huge capacity for producing enzymes and are completely harmless for humans. Enzymes are fully biodegradable, unlike most industries that result in production waste. Man-made chemicals can threaten nature. Enzymes can do the same job cheaper and do not threaten the environment. Enzymes are a part of nature and are therefore fully biodegradable. When industrial enzymes have done their job, they leave the production plant with the waste water. The retired enzymes do not last long in the surrounding environment. Nature has many microorganisms that easily break down enzymes into single amino acids, which are used to build up life around us. The fact that there are no hazardous waste products makes industrial enzymes the most environmentally friendly solution to most industrial problems. In short, all enzymes are proteins, but not all proteins are enzymes. Enzymes catalyze all processes in the body, enabling organisms to build up chemical substances such as other proteins, carbohydrates, or fats that are necessary for life. If a protein can catalyze a biochemical reaction, it is an enzyme. There are many different kinds of protein that can be split into two basic groups. The first group covers the structural proteins, which are the main constituents of our bodies. Well-known structural proteins are collagen, which is the protein of bones, tendons and ligaments, and keratin, the protein of nails, hair, and feathers. The second large group of proteins covers the biologically active proteins. Most of these catalyze biochemical reactions in cells. Enzymes have been used in brewing, baking, and alcohol production for thousands of years. Our ancestors did not call them enzymes, but they certainly used them. One of the earliest written references to enzymes is found in Homer’s Greek epic poems dating from about 800 BC, where mention is made of the use of enzymes in the production of cheese. In Japan, people used naturally-occurring enzymes in the production of sake, a Japanese schnapps brewed from rice, for more than a thousand years.